I was in Nottingham to attend a hackday, but the night before that, I wandered through Nottingham and had dinner at a restaurant named Manga Sushi. I imagined that eating there would turn me into a manga character. 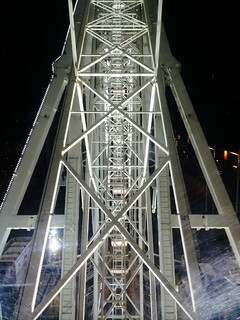 I went on the ferris wheel in the market square that night and looked out over the city, at the lights shining, and listened to tales about Nottingham, as the wheel spun round. That night, in the hotel room was a bottle of sleep spray and a quote, "Sometimes the dreams that come true are the dreams you never even knew you had" - Alice Sebold. Thanks! I went to the seaside, even though it was not quite the weather for it.